We Warranty every Jeep we sell! If It has 10,000 miles OR 200,000 miles, our certified mechanics have checked it out and it is Warrantied for your safety and security. We will deliver any jeep you purchase from us at the advertised internet price for free with in 300 miles! Over 100 jeeps available! Let us customize your jeep, to fit you needs. Wheels, tires, Tops, Bumpers, etc. If you see a vehicle you like we can swap wheels, tops, doors, what ever your needs may be! We will deliver your new Jeep to any where with in 300 miles of our office at absolutely no cost to you! 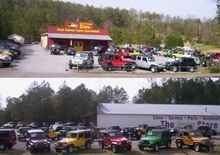 We have the largest selection of Used Jeeps in Atlanta, Georgia and in North Georgia! Contact us today at 770-382-1616 for more information, or fill out our Online Credit Application to begin the pre-approval process today. We will deliver your new Jeep vehicle to anywhere within 300 miles of our office at absolutely no cost to you! Disclaimer: We can not Guarantee that all features,options or accessories appear on the vehicle or are stated about the vehicle are present. We do swap wheels, tires, tops. We add accessories and remove them in order to create the perfect Jeep vehicle for each individual customer. It is the customers responsibility to inspect the vehicle and verify the features, options and accessories on the Vehicle. Contact The Preowned Store today for more information on this vehicle.